The JD editors Daniel Koehler and Christine Hutzel present the eigteenth issue of the Journal for Deradicalization (JD), the Spring 2019 edition. All articles of the Journal for Deradicalization (JD) - which is the world’s only independent and completely peer reviewed journal for deradicalization - are published with 100% open access and can be viewed and downloaded free of charge. The JD is published four times per year (quarterly). The JD editors Daniel Koehler and Christine Hutzel present the eighth issue of the Journal for Deradicalization (JD), the Summer 2016 edition. All articles of the Journal for Deradicalization (JD) - which is the world’s only independent and completely peer reviewed journal for deradicalization - are published with 100% open access and can be viewed and downloaded free of charge. The JD is published four times per year (quarterly). The JD editors Daniel Koehler and Christine Hutzel present the fourth issue of the Journal for Deradicalization (JD). 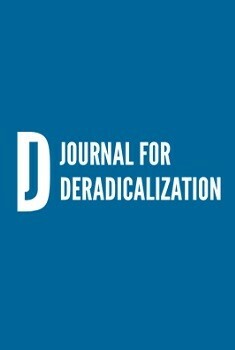 The Journal for Deradicalization (JD) is the only independent and peer reviewed open access online journal about the theory and practice of deradicalization and processes of radicalization worldwide. The JD is published four times per year (quarterly). The Journal for Deradicalization (JD) is based on the independence and transparency of academic standards. All articles are openly accessible free of charge and peer reviewed by experts in the field – practitioners and academics – to ensure the policy relevance without compromising professional scholarly standards. The JD is completely independent of any specific institution or partisan policy regarding (counter-) terrorism and methods of deradicalization. Impartiality, objectivity and accuracy are guiding principles the editors Daniel Koehler and Christine Hutzel expect contributors to adhere to. The JD’s board of expert advisors consists of the world’s most renowned scholars on deradicalization: Prof. Dr. John G. Horgan (Georgia State University); Prof. Dr. Tore Bjørgo (Research Director, Norwegian Police University College/Senior research fellow, NUPI -Norwegian Institute of International Affairs); Prof. Dr. Mark Dechesne (Leiden University); Prof. Dr. Cynthia Miller-Idriss (American University Washington); Prof. Dr. Marco Lombardi (Università Cattolica del Sacro Cuore Milano); Dr. Paul Jackson (University of Northampton); Prof. em. Michael Freeden (Oxford University); Prof. Hamed El-Sa'id (Manchester Metropolitan University); Dr. Omar Ashour (University of Exeter).